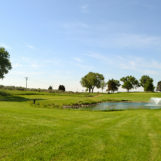 GARDEN CITY, Kan. — The Finney County Convention and Visitors Bureau announced on Tuesday that Buffalo Dunes Golf Course in Garden City will host the 2020 National Junior College Athletic Association Women’s Golf National Championship. The event will take place May 10-14, 2020 and will bring in over 130 golfers to Garden City. The tournament will consist of four rounds (72 holes), 18 holes per day with golf starting on the 11th. The practice rounds will take place on the 10th. “It’s an honor to partner again with NJCAA for another national event creating opportunities and economic investments in Finney County and the surrounding areas,” Roxanne Morgan, Executive Director for the Finney County Convention and Visitors Bureau said in a press release. The Finney County CVB will be teaming up with Garden City Community College to host the national event. For more information regarding the NJCAA or women’s golf go to NJCAA.org.